At the risk of sounding a bit nerdy here, one of the habits I’ve developed over the last few years is to choose an area in my life to focus on or experiment with each month. Sometimes it’s something I do on my own but often I’m able to convince my Irishman to join me. For example there was vegetarian month a few years ago and then alcohol-free month (aka ‘Famine February’). We’ve also done exercise every day month and of course the current focus is all about parenting. Recently we experimented with going gluten-free for a month. Since adopting a ‘mostly’ paleo approach to eating a few years ago, gluten products haven’t really featured heavily for us. Except for our weekly ‘cheat day‘ where anything goes. The interesting thing is that even only having gluten once a week or so, my Irishman had been having some ‘digestive’ problems. Which sparked the idea to experiment with going completely gluten-free. The good news is that it made a huge difference to the digestion problems. And really it wasn’t as difficult as you’d think. By approaching it from a ‘let’s focus on what we can eat’ mindset there are so many options that don’t include gluten or rely on expensive commercial ‘gluten-free’ substitutes. Here are 16 15 of my favourite GF ideas. While there are some surprisingly good gluten-free breads available these days, they tend to be very expensive. A better and even healthier alternative is to switch to having a hot breakfast a few days a week. Fried eggs are my Irishman’s favourite where as I prefer mine poached (and am very much enjoying my post-pregnancy runny poached eggs). Feel free to use a commercial granola or muesli. But if you’re up for making your own, I recommend this lentil granola or this decadent chocolate option. My local supermarket now stocks rolled quinoa in the health food section. I’ve been loving using it to make a gluten-free porridge or oatmeal, pretty much just cook it the same way you’d cook oats. Oats themselves don’t contain gluten but are often produced on equipment that also processes wheat so there can be gluten present from cross contamination. These days you can find oats that have been kept gluten-free but they do tend to come with a hefty price tag. UPDATE: Thanks to the Stonesoup readers who emailed and commented to let me know I was wrong here. (I should know better than just using Wikipedia for my research!). I’ve since learned that gluten is the name for a group of proteins. Oats do contain a protein that is classed as a ‘gluten’, although it’s a different protein to the one in wheat which is also classed as a gluten. So oats can be wheat free, if handled and processed on separate equipment. But they can’t be gluten free. So if you’re coeliac oats can still cause problems. Interestingly it’s apparently illegal in Australia to label oats as being gluten free but not so in other countries. 5. chia seed bran, psyllium, gluten-free oat bran instead of wheat based bran. If you love your wheat bran based cereal, try using one of the above options instead. I particularly love chia seed bran because it isn’t as gloopy as psyllium and is quite high in protein. Instead of regular wraps or sandwiches wrap your filling in iceberg lettuce leaves. You’ll need more filling to make up for the lack of bread. Make a composed salad to take to work with you. I’ve been doing this for years without thinking too much about it but Hugh Fearnely-Whittingstall brought the idea to life in his book River Cottage Everyday. Think leftover cooked meat or fish, canned tuna, boiled eggs. ii. Choose something to bulk it out. Starchy foods work well here such as canned chickpeas or beans, leftover cooked potatoes, roast vegetables or cooked quinoa. Or try some vegetables like finely chopped raw or steamed broccoli, grated raw vegetables, salad leaves or avocado. iii. Add a highlight ingredient. Like goats cheese, other cheese, roast nuts, fresh herbs (basil, mint or parsley are best) olives or cherry tomatoes. It could be just a drizzle of olive oil and a squeeze of lemon or lime. Or a big dollop of pesto, hummus or olive tapenade. Toss your favourite sandwich filling with a drained can of chickpeas, beans or lentils and a little olive oil for a quick lunch salad. In Winter you can warm the legumes first in a pan with a little oil. If you’re in the habit of having cheese and crackers / bread or dips and crackers to start a meal, either skip the crackers or replace with raw veg such as carrots or celery. There are so many options to replace your pasta with vegetables. My favourites are zucchini ‘fettuccini’ (see varations below for cooking instructions), carrot ‘spaghetti’ (shave with a vegetable peeler to get ribbons then cut into ‘spaghetti’. Simmer in boiling water until just tender) or zucchini ‘orechetti’ (slice zucchini into coins and pan fry in a little oil until just tender). All can be used in Italian style dishes or to replace wheat based noodles in Asian cooking. Serve your favourite bolognese or other hearty pasta sauce on a bed of greens. Baby spinach is great or try wilting greens such as kale, spinach, collards, chard or silver beet in a pan with a little olive oil. Replace bread crumbs in meatballs or meat loaf with almond meal. Same goes for bread crumbs used as a coating. Whizz raw cauliflower in a food processor until you have instant ‘couscous’. No need to cook but if you’d prefer it warm you can heat it through in a pan with a little oil before using. Just boil red lentils until tender. Drain and use anywhere you’d use couscous or risoni (little rice shaped pasta). The problem with most commercial gluten-free flours is that they’re very low in protein whereas wheat flour contains gluten so has a higher protein level. So I’ve found that just substituting ‘gluten-free’ flour doesn’t give good results. Almond or other nut meal or ‘flour’ tends to give better, if heavier results. In general I’d recommend looking for a recipe that is designed to use almond meal rather than experimenting yourself. Most of the recent sweet treats on Stonesoup are either gluten-free or contain a GF variation. I’ve been experimenting with flour from higher protein sources like chickpeas and quinoa but haven’t found anything I’m super happy with yet. My favourite ‘cheat’ way to make GF tarts is to crumble commercial GF cookies or biscuits like shortbread and combine with a little melted butter. Then spread the mixture in your tart shell and chill until set. Mung bean pasta is something I discovered in a health food shop. 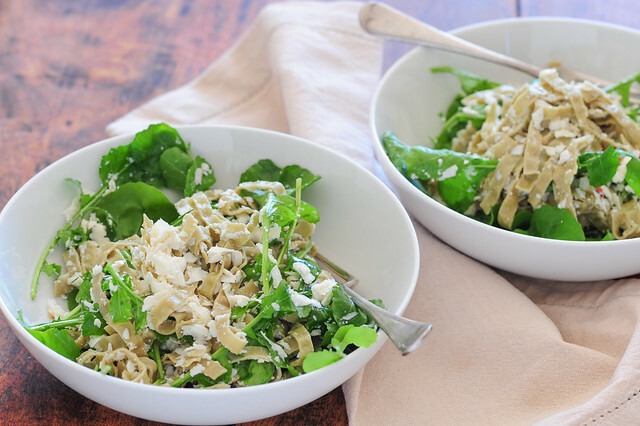 While it sounds a bit to ‘healthy’ tasting and is quite green in colour, it’s actually surprisingly delicious and hits the spot when you’re in need of some pasta ‘comfort’. It’s gluten free but the best part is that it’s very high in protein and fiber and much lower in carbs than regular pasta. Win win! I don’t normally like to recommend brands because the Stonesoup readership is global, but the one I’ve been using is called ‘Explore Asian’. 1. Cook pasta in a pot of salted boiling water as per the packet directions. 2. Drain pasta and return to the pot. 3. Toss in 3-4 tablespoons extra virgin olive oil, chilli, lemon juice, rocket (arugula) and about half the cheese. 4. Taste and season. Serve in bowls with remaining cheese sprinkled over. different pasta – Just use your favourite gluten-free pasta. Of course it will also work with regular pasta as well. I prefer long pasta like fettuccini, linguine or spaghetti for this for some reason. But short pasta will be fine too. paleo / pasta-free – replace cheese with finely sliced prosuitto or ham and replace pasta with zucchini ‘noodles’. For zucchini noodles, shave 2-3 zucchini (courgettes) into ribbons using a vegetable peeler. Layer onto a baking tray and drizzle with olive oil and bake (200C / 400F) until tender, about 10 minutes. no pasta – replace pasta with a drained can of chickpeas or white beans. Heat the beans in a little oil in a frying pan then remove from the heat and continue from step 3.
vegan / dairy-free – replace cheese with chopped or finely grated brazil nuts (use a microplane). carnivore – toss in some torn, finely sliced ham or proscuitto as well as or instead of the cheese. different leaves – replace the rocket (arugula) with basil, flat leaf parsley, baby spinach or finely shredded raw cabbage. less heat – just skip the chilli. I note you state that oats is gluten free. According to the Coeliac Website and others (not most US sites) oats contain a gluten called Avenin. Some people are sensitive to this particular gluten. Below is the Coeliac website you may find useful. Thanks for enlightening me Glenn! Actually oats do contain gluten in the form of avenin.. however , unless you are a diagnosed coeliac small amounts of gluten will not constitute problems for most people. It is the over use or overconsumption of so many food constituents that cause varying degrees of discomfort or metabolic error..lets just practice variance in what we eat with the emphasis on plant foods and most of us are healthy and happy! Im always fascinated with your creative ways with avoiding allergens. I am not allergic but have an intolerance for all creatures with claws, shells, hooves and horns and gluten and I have long been enemies. So I am grateful for fish and for all the creative ways you come up with for food. Any good ideas on how to supplement an almost vegetarian diet? A friend of mine is on a gluten free diet which also has to be low oxylate. One of the things that she really misses is “crunch” in her diet. She would absolutely love to have the occasional crunchy biscuit but the only recipes that she can find are for American style cookies which always turn out soft and chewy rather than crunchy. Talk about ESP!!! I was going to try a gluten free month in August. Thanks for all the great ideas! I love the idea of vegie pasta and have done that before. My fav is cucumber ‘fettuccini’ with a creamy dill sauce which is awesome in summer. Must try the mung bean pasta. Sounds yum. Thanks for this list. I am working towards gluten-free. Most days I am – haven’t had bread, pasta or cereal for months. Getting there. Some great tips here – I like the lunchbox salad – that is the sort of thing I need to be making for my lunch – though I would start with a veg protein. In my extended family we love rice crackers and dip because it covers the vegetarians and celiacs. I was surprised to hear you hadn’t had any success with chickpea flour (actually I didn’t like it for a while) – I have used it (and blogged about it) quite a bit for GF baking – it is brilliant substituted for regular flour in brownies, works really well as a pizza base or in crackers. I keep in the fridge at all times. Or recently I tried it just mixed with flour and pan-fried as a quick-fix flatbread. Plus socca is brilliant. Congratulations on making the leap. We’ve been gluten and dairy free now for almost a year. The first thing we noticed was that my adult daughter who had been complaining of aching joints since she was a child stopped feeling the aches and pain she had been accustomed to. Whew! Who would have thought the problem was wheat. I read Wheat Belly and became convinced to at least try. Like you, we have eggs without toast in the morning. Sometimes we have vegetables with our eggs but most mornings it’s just fruit. We’ve found a wonderful brand of cut up bacon at Costco’s and some onion and a very small handful of those fried over medium heat and then added to scrambled eggs is tasty enough that this morning even though we got up late, I was able to make breakfast and pack my daughters work lunch in 15 minutes! We live about 1 hr away from a wonderful bakery that has just started making GF bread. They may a pumpernickel loaf that is truly good. It’s a bit drier than the original but very tasty. We buy 4 at a time, slice them and wrap them in plastic wrap and freeze them. That way I can pop two out of the freezer and toast them, or stick them in my daughter’s lunch frozen along with stuff to put in them for a sandwich. We don’t eat a lot of bread because we are also low carb and while you can make decent GF baked goods with practice, we just don’t make a lot. Noodles and Spaghetti are what I miss the most but rice noodles (I’ll have a look for the mung bean noodles; I assume you don’t mean bean thread noodles because they are just starch) and corn pasta fill in quite nicely. I like your try it for a month approach. I must think about that. I have been using the spoon he uses to take the egg out to place the egg in. Its easier to do than the strainer. After realising that Wheat was a migraine trigger for me, I had to re-think the whole lifestyle, menu and shopping list. In the beginning it was daunting and very frustrating, but luckily a lot of local and imported products became available – some are nice but it’s not the real thing, it you know what I mean. I also took some of my favourite recipes and tinkered with it to make it Mia-friendly aka high protein wheat free. Good ideas. I’ve also used shredded cabbage, cooked lightly, as a base for spaghetti sauce with meatballs, or with pulled pork. We also love spaghetti squash. Hi Jules. Making your dulce de leche icecream. I just wanted to say how much I love your ideas! It seems that our thought processes are running in tandem in an ever so spooky way. Every time I think “hmmmm I wonder how I could do this or that” there you are having done all the research and donkey work with a plethora of wonderful ideas for me to enjoy. What an inspiration you are Jules. More power to your lovely elbow. Just a not to say how much I enjoy reading your words. So much good, practical advice! I’m a 66 year old, and often improvise and experiment with every-night dinners ( helps to fight the boredom factor) but always read your emails just to see what you’re doing. And, last but most of all, huge congratulations on the birth of your baby boy! That’s a life changer. I wish you and your little family great joy! My best discovery so far is buckwheat pasta which is really delicious and so sustaining. And I do live on ricecakes which are so versatile. Giving up wheat coincidentally made those pesky extra kilos drop off, after years of trying with dietary restraint and reasonable amounts of exercise. I wasn’t anticipating this side effect, but it is quite marked and has certainly lasted past the first surprising months. Great post on gluten free, but wondering about my favourite winter food, Polenta? Can those who are gluten intolerant eat Polenta? Yes polenta is corn based and doesn’t contain any of the gluten proteins… so you’re all good! I’ve just discovered black bean spaghetti in my local health food shop. We have been having that with stir fry and the kids love it. As well as being a huge protein hit, it doesn’t stick together like normal pasta which makes it easier to handle. Great ideas, I especially love zucchini noodles. But eggs and toast just isn’t complete without the toast part. Good thing I’m not actually a celiac. I cut out bread a while ago and I feel so much better – no more bloated feeling. Eggs for breakfast works and as they are high in protein thay make you feel full for longer so good for trying to loose weight. I also have 2 poached eggs on a plate of salad (if I’ve not had eggs for breakfast that is!) for lunch. Fruit and yoghurt is another good breakfast alternative. Since cutting out bread I seem to eat a lot less carbs now anyway. I feel much better for not getting so stodged up! Thanks for the great ideas Jules. I have cooked for a few gluten-intolerant clients and it really is not as hard as people think. I could easily re-create breaded fish and chicken dishes, pasta dishes, and the like. There are so many wonderful gluten-free products out nowadays. I particularly like the quinoa pasta. Have you tried it yet? I’ve been loving quinoa spaghetti… thanks for reminding me! What about coconut flour as a baking substitute? It’s a bit of a weird beast because you only need a very small amount of flour, but I’ve had some great success with coconut flour. In fact I made some delish coconut flour pancakes (recipe on my blog) this morning with macadamia coconut cream and kiwi fruit. Yay Sunday mornings. I’ve played around with coconut flour and haven’t had much success with using it as a substitute… ended up with some really weird textured baked goods… So for me it’s best to use in recipes that are developed just for coconut flour rather than trying to use it as a substitute. Your pancakes sound lovely though! Absolutely! I’m not confident ‘off-roading’ with coconut flour yet either! My thanks to Mary. That poached egg looks so delicious. I have been gluten free for over 8 years. I relate to the comment regarding missing the “crunch”. My solutions include Boar’s Head Pepperoni or Dry Salami, thin sliced and grilled briefly for salami chips. Please grill outdoors as the smell can be somewhat intense. We have discovered a salt free El Milagro Tortilla Chips Estilo Casero corn chips made with corn oil (not sunflower oil) sold at Whole Foods. Before that I would turn the oven to 375 degrees, place an oven safe dish with a piece of parchment paper on top, and place a corn tortilla. Turn after a couple of minutes to dry it out and turn two or three more times. After no longer than 5 or 6 minutes the tortilla will brown nicely. After it gets crispy enough I break it up a bit and eat two for a nice crunch. Baked for a little less time corn tortillas can provide a nice wrapping for scrambled eggs and cheese, or fresh pinto beans and cottage cheese or lightly grilled proscuitto and swiss cheese (make your own mustard, yum). I also sautee trimmed brussel sprouts in olive oil for a terrific light crunch. Be careful to stir as they scorch quickly. I serve alone or with white rice. Include a nice vinaigette. I trim the end off and then dice a couple of pieces starting with the core and peel as many leaves as possible. Sautee both the diced pieces and leaves with salt and pepper to taste. Last, anyone choosing gluten free in the U. S. must be aware that vinegar is often made with wheat. I am also allergic to potatoes so I must avoid mayonnaise (even the gluten free brands) and mustard (now that it is made with vinegar instead of wine vinegar). Apple cider vinegar is OK. I didn’t know about oats. Thank you Jules and all for that info. I am not Celiac but I am gluten intolerant. What are some good substitutes for oats, especially in oat meal? You may not be intolerant to the gluten in oats… It’s a different protein to the one in wheat.. So oats may be ok for you… But if you want to play it safe the best alternative I’ve found for oatmeal is to used rolled quinoa flakes. Just wanted to comment on a few things. First, most celiacs are sensitive to the gluten protein found in wheat not in oats. Some celiacs will be sensitive to both but it’s really a grain sensitivity for those people and they can also have digestive issues with corn in those cases. Some celiacs have no issues at all with oats. Another note is that what vinegar is made of completely depends on where you live and what crops are plenteous in your country. If it’s a profit of Mexico yet the vinegar will most likely be made from wheat. However if it’s American vinegar is most often made from corn not wheat. However, as mentioned earlier if some people that have gluten intolerance also have issues with grains such as corn. I am gluten-free but also have many other intolerances… Onions, chili powder, cloves/allspice, coffee beans, milk, coconut anything, limes, lemons. … I am frustrated because there is nothing good that I can drink besides most wines and cucumber water. I miss hot creamy drinks but hate the taste of soy or almond milks. I eat a lot of homemade French fries and corn chips. I feel better when I don’t have corn in my diet but it is so easy to grab popcorn or tortilla chips in a hurry. I have unfortunately began eating peppermint candies constantly because I’m hungry or thirsty… Or just because peppermint helps calm me but now I think my sugar is screwed up. I need more protein! I need simple and satisfying alternatives! Grrrrr! Thanks for the great ideas! I already do a lot of them, but some things I had never heard of. I love using lettuce as a sandwich bun. My favorite “bun alternative” though is using apple slices or a sliced banana as a bun for peanut butter sandwiches! I got cut off LOL! Anyway I was going to continue. So over the years I’ve become complacent and just ate as I chose to… Now I’m 37 and suffering from very low Vitamin D, low B-12, I’m anemic, am not processing protein and sodium which has caused a trigger effect of not allowing me to lose weight… I’ve been on a high protein low carb diet for a month and a half and wasn’t getting any results. i decided a nutritionist has become necessary… this is how I found out all of the above. I’ve been searching the internet for ways to substitute everything… As everything has some ingredient in it that I can’t tolerate… Food has become very expensive for me, but I’m feeling much better. I’ve switched to almond milk and coconut milk instead of dairy milk. I use vaganeese instead of cheese, try to use gluten free recipes, and avoid eggs, I only use paleo recipes that don’t have eggs in the recipes… My problems isn’t gluten though.. it’s solely wheat. I’ve struggled much though as I am still trying to lose weight and high protein breakfasts are quite the challenge! I hope my story inspires someone to create breakfast ideas for the no dairy, no eggs, no gluten, high protein person :-) thanks for asking me to share my allergies and my story!! I’m curious about the oats comment. I have a bag of gluten- and dairy-free oats from Bob’s Redmill. I also have a cookbook titled “1,000 Gluten-Free Recipes” by Carol Fenster. In her book, she lists gluten-free are available at bobsredmill.com, creamhillestates.com and onlyoats.com. She does include a note that reads “check with your physician before using gluten-free oats.” I asked a dietician and she said they were safe. Chocolate brownies made with ground garbanzo beans are fudgy and rich, especially with a little powdered coffee added. All ingredients go in food processor with melted dark chocolate chips. Heavenly! I am diabetic, I’ve had mild asthma all my life, am totally allergic to cigarette smoke, and have recently realized I have a gluten problem. I have come up with a Frappuccino recipe (2 days ago) that I can share. In a Ninja Storm blender add: 1-1/2 cups chilled espresso, 2 Tbsp. Agave nectar, 1/2 cup milk, and 1-1/2 cups cold water to the Ninja pitcher. Do long pulses until smooth, it’s a real treat! The BEST gluten free brown rice pasta SPAGHETTI style: Tinkyada Pasta Joy. Hey ! i enjoyed your article. Have recently been diagnosed with coealic disease :( Im just wondering if you could offer any alternatives for bread? I dont really like gluten free bread so im wondering if you know any other alternatives there are to making sandwiches, other than using gluten free bread or lettuce leaves?